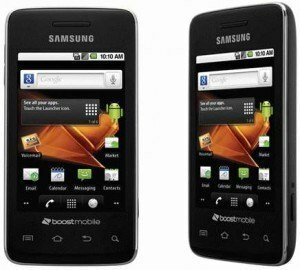 In this tutorial we are going to reset android on a Samsung Galaxy Prevail device, using two different methods. We will bring your Samsung Galaxy Prevail to it’s out of the box state. If you can access the applications menu on your device, you can use any of the two methods to reset android that we will explain. If the Android OS is failing, or you forgot the lock pattern and can therefore not access the Samsung Galaxy Prevail you will use the second method described, which uses a combination of hardware buttons to reset android on the mobile phone. Before you start with any of the two methods, please make sure your battery is fully charged, to avoid any inconvenience in the middle of the process. Select Erase everything, and this will restore the phone to factory settings. Make sure your phone is turned off. One way of doing this is removing the battery for 5 seconds and then putting it back in place. Press and hold at the same time the Volume Up Button and the Power button. When you see the Samsung logo let go of the Power button while still pressing the Volume Up button. Release the Volume Up button when you see the recovery menu on the screen. Then select yes, and the reset of your Samsung Galaxy Prevail will begin. At this point you should have succeeded to reset Android on your Samsung Galaxy Prevail, but if you had any issues please let us and others know through the comments, and maybe we can help.